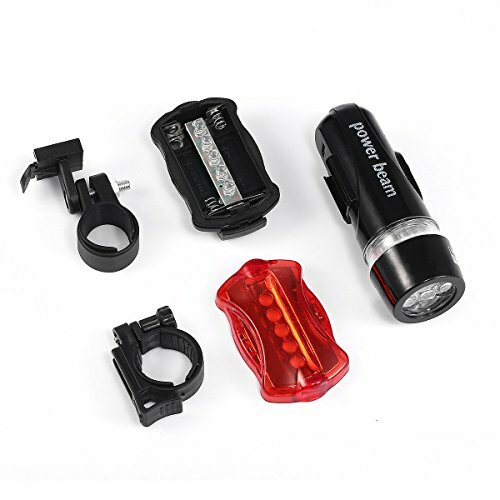 Flashlight Pack 4H-4R-4B Value Family Bicycle Light Set Safety Travel Light Night Riding Multi mode Operation LED Light Nice Gift Kid Bike GD-L5 by MOJIWING at Wander Soul. MPN: GDL07. Hurry! Limited time offer. Offer valid only while supplies last. Product Features: 1. Easy to attach & adjust. 2. 5 Bright White LED lights in the Front. 3. 2 Operational Modes (Steady & Flashing) at head light. 1. Easy to attach & adjust. 2. 5 Bright White LED lights in the Front. 3. 2 Operational Modes (Steady & Flashing) at head light. 4. 6 operational modes (steady & different flashing modes) at rear light. 5. Front & Rear Quick Release Fitting Brackets. 6. Multiple Use for Front Light, can be used as a torch. 7. Long Lasting, Up to 160 Hours per set of Batteries. - Headlight batteries, body and cover must be aligned correctly in order to work. - Align the power button on the battery holder with the power button on the headlight body. The LED Bike light set mounts quickly onto bicycle handlebars and seat posts. Visible to motorists over 1500 feet away. The headlight has 5 LEDs that can light up roads for over 40 feet and features a toolless handlebar mount. Once mounted it has a quick-release system for removing the headlight from its mount. Cut-away design allows light through the sides for more visibility. The taillight is angle adjustable and removable from its seat post mount with a clip-on quick-release system. Fits most handlebars and seat posts (rubber sizing shims included). If you have any questions about this product by MOJIWING, contact us by completing and submitting the form below. If you are looking for a specif part number, please include it with your message.